HangMessage is a location-based mobile messaging app where users hang messages in the air at specific locations for their friends to receive and read. Users can type in an address, select their current location, look up addresses in their phone contact book or choose from a list of check-ins made by their friends on Facebook or Foursquare. HangMessage is a great way to surprise a friend or loved one with a message pinned to a memorable location or even send yourself a grocery list so once you enter the supermarket, you’ll be reminded of what you need to buy. 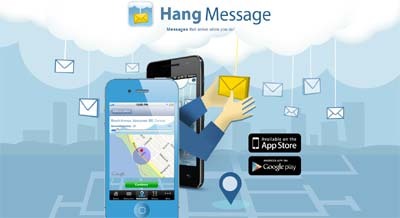 HangMessage beats its competitors by allowing their users to hang a message at specific addresses for their friends to pick up the next time they visit that location whereas most location-based messaging apps focus on chat room-like environments between strangers with similar GPS locations where anyone can leave and enter the group. HangMessage increases interactions from other social networks by integrating Foursquare and Facebook which allows users to select from a list of their friend’s recent check-ins to hang a surprise message there. With the “spyglass”, an augmented reality component, recipients will be notified of any unread HangMessages, which one of their friends sent the message and how far away the message is placed relative to their location. Using the provided map with walking and driving directions, users can go to that location to unlock the content of the message.